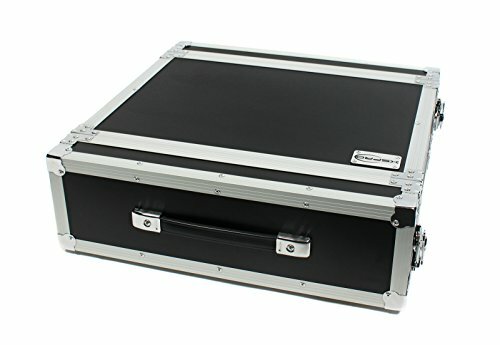 XSPRO XS3U-14 3 Space ATA Rack Flight Case - Front Back Rails 14" Depth Product #: XS3U-14 Product Description This case is identical with the XS3U-10 but is 4" deeper. The XSPRO case is built to house 3 unit spaces of standard 19" rackmount gear. Constructed of 1/4" plywood, the XS3U-14 features metal corners, aluminum on all edges, and front and back rails. FEATURES: * 1/4" Plywood w/Black Laminate * Tongue & Groove Metal Railing * Rubber Feet * Tough Metal Corners * Industrial Rivets * Industrial Latches * Heavy-Duty pre-tapped Rack Rails (w/Screws) * Front & Rear Rack Rails Dimensions: * Lids On: 20 1/4" width x 20 5/8" depth x 6 3/4" height * Lids Off: 20 5/8" width x 14" depth x 6 1/4" height * Inside ** Rail to Rail: 12" ** Top to Bottom: 5 1/4"